I swear to all that is sheepy and sacred that I am in clog hell. 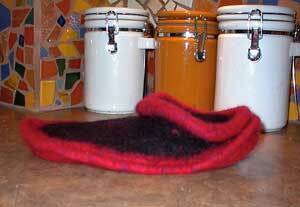 I knit some clogs for my friend and her husband and turned them over to her for felting. Later that day she calls, sounding a little worried. She’s felting the clogs, and apparently the clogs look…strange. I tell her to drop them off and I’ll fix them. This happened with Ken’s clogs at Christmas. 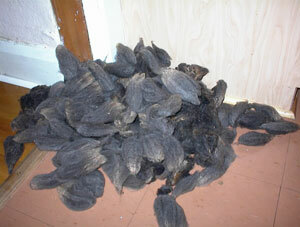 The wool didn’t felt evenly and it just took some hand-felting in the bathtub to convince them to be nice clogs. No problem. Whatever the problem with these clogs I can fix them. I am super knitter. Yeah, well. Pride goeth before a fall. I opened the bag and the world whirled darkly around me. I actually felt woozy. This is really more of a disk with a foot opening than a clog. Clearly it has crossed over to the other side. Way over. There is nothing for it. 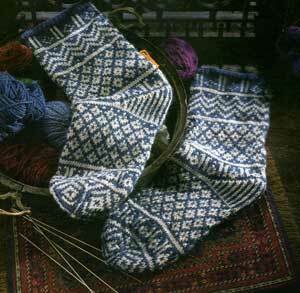 I am going to have to knit 2 more pairs. I’m going to use different yarn (the red didn’t felt) and I’m going to try not to look back. Sirdar Snowflake with this pattern. I feel better. I need the foot size before I can go any further. That’s three days of evening knitting. Magic. I swear it’s magic. 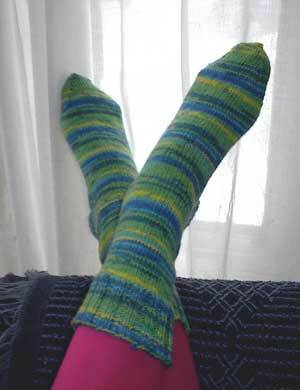 I cast on the Mamluke socks last night and gleefully knit my little heart out. 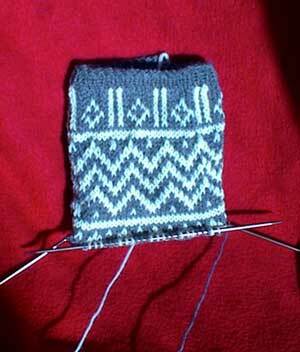 When I knit fair isle I carry one colour in my left and one in my right. 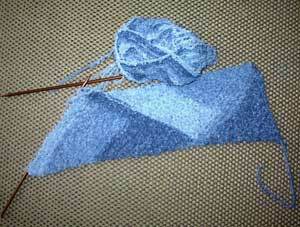 This is way slower than the way I knit flat stuff, which is as much as possible. Yeah, yeah, tell me again how great circulars are. I know they work for you. I however am the last great holdout for straight needles. Long straight needles. Love them. As much as I love long straight needles (is it just me or is that starting to sound dirty?) I see the wisdom of knitting fair isles circularly, but for me, knitting circularly with one colour in each hand is slower. I know this to be an absolute fact. Can somebody tell me then, how it is possible that it takes me longer to make each individual stitch, but have the rows go faster? I mean, if that was a plain grey sock, I could have knit around and around at lightning speed and have 2 inches at bedtime. 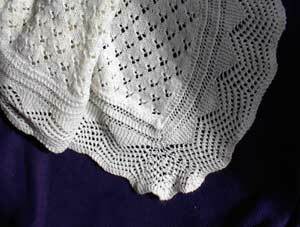 Give me fair isle and I knit each stitch more slowly but each intriguing little row piles up on top of each other at an astonishing rate. That’s 5 inches of sock! 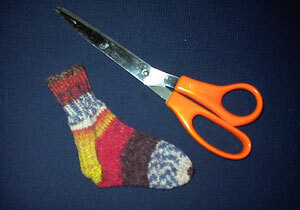 Who can knit 5 inches of sock during one moderately interesting Denzel Washington movie? Not me man, it’s just the miracle of fair isle. It’s how Wendy does it. Knitting Voodoo. Is what the girls did with their day yesterday. Note the mohawk. Be afraid. Is what I did with part of my day yesterday while I tried not to think about the barbie. It’s the shetland from tuesday. 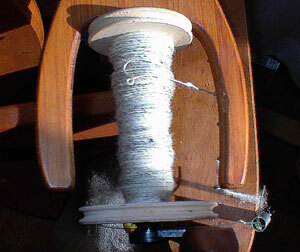 This is the lightest batch, and I’m spinning sock weight 2ply for the cuffs of some socks. Looks pretty good eh? I realized today that to finish all of the projects that I have to finish before March ends I am going to need to warp the time-space continuum. That’s such a pain in the arse. Today is a PD day. This means, for anyone who lives in a place in the world where they call it something else, that the children have a day off school. All of them. Even though it is not a holiday, or a day of any special significance, and even though it is a regular work day for grownups…they are home. I hate PD days. I work from home mostly so a PD day means that there are three children in my office. My usual strategy (when there are three children in my office) is to give up, fork over the day to them and not try to get anything done at all. It’s sort of like going limp and playing dead when the bear corners you. I just keep giving them food, playing board games and hoping for the best. I thought that very little could turn a PD day into a good day. I was wrong. Not excited? It’s to knit these..
See? I knew you would be excited. I’m thrilled. 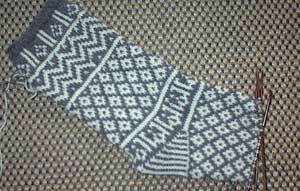 Ken’s fathers birthday is soon, and these are the Mamluke socks from “Folk Socks” by Nancy Bush. I would knit them out of love, I really would. Ken clearly doubts that, since in the box from Yarn Forward there was also this. 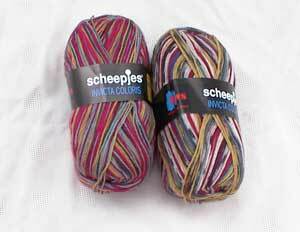 Scheepjes Invicta Coloris in “Rainbow” and “Crayons”. This is clearly a bribe, and it’s a good one. I love sock wool. 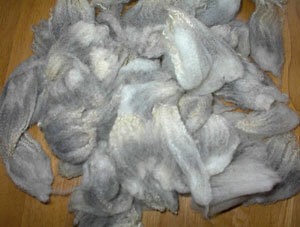 I’m absolutely stunned by what I will do for sock wool. It’s embarrassing. 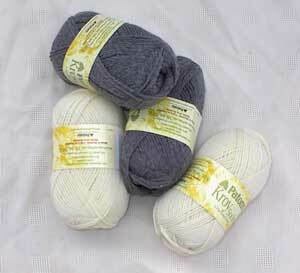 I’m going to reward myself with this yarn when I am done the Mamluke socks. I need these little motivators. Why can I add more socks to the WIP file? I finished these! Megans “Kroy stripes” socks. She loves them. She apparently loves them with bright pink stockings, which is somewhat of a surprise, but who am I to decide what matches socks like that. Knitting these socks sucked and I’m glad to see the back of them. The Kroy stripes seems a little thicker than the regular Kroy, so I knit one of them twice. (Bitterly, really bitterly. The label claims that the all the Kroys have the same gauge…LIES I tell you, damn lies) I didn’t think the yarn was as soft as the other Kroy (which is a great sock yarn) and I wasn’t nuts about the striping, mostly because it didn’t freaking stripe. Stripes are sort of the minimum I expect from a sock yarn called “Kroy Stripes”, but maybe I’m being fussy. Meg picked the yarn and Meg loves them so lets just focus on that. Next time…Meg can knit them. While I was at the yarn shop this morning (…er, yeah the yarn shop, didn’t I mention I went there? I was only there for a minute. Didn’t buy much. Stop looking at me. Nothing to see here). 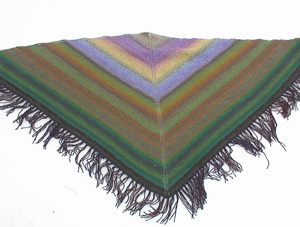 I spoke with Margret Haas, nice lady, yarn store owner extraordinaire and most importantly for our purposes, the designer of the shawls you all are coveting. She has some kits left, though the yarn is discontinued, and the pattern comes with the kit. Margret’s willing to ship some to you poor desperate souls. Order, enjoy…but be warned. 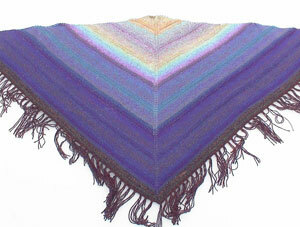 The shawls are a little on the addictive side. Just after I wrote about spinning the shetland on Tuesday (and right after I covered the house in fleece rats) my pager went off and I rushed off to a birth. 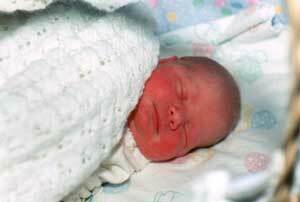 Baby born: one baby boy, 3200g (7lbs 2oz) pretty darned cute. Knitting done: one sock (ok, it’s a small sock, but I was busy) I always knit, or at least cast on, something for the baby during its birth. I’ll knit the mate and take it to them at a postnatal visit. Funniest moment: When a nurse clearing away garbage picked up the sock I had just finished (she was watching me knit it two minutes before) and asked me quite earnestly “did you want to keep this?”. 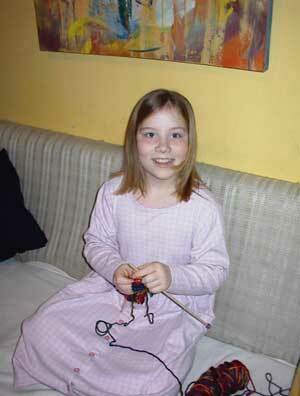 “Er…yeah, I knit that” I said (sort of wondering where she was going with this). “Oh” she said, replacing it on the table, “I thought you were just knitting for fun”. I was too tired to come up with a snappy response, so I just sort of stared at her. I mean, even if I did knit just for fun, which I suppose is mostly true, why would you throw away what you knit? 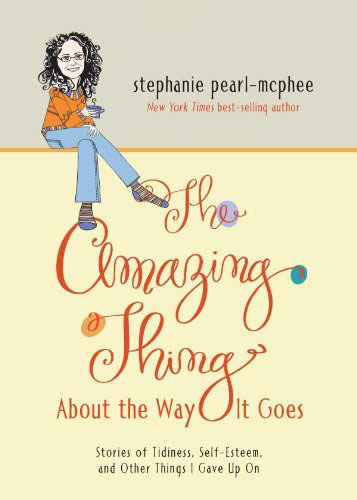 I imagined knitting a whole sweater, then carefully sewing all the seams, then picking it up, showing it to your family, admiring it, then crossing the room and unceremoniously dumping it in the garbage. Maybe that thought isn’t cracking you up now, but last night, sleep deprived and hopped up on lousy hospital coffee, it was hysterical. Today will be dedicated to restoring the house and family to working order, since whenever I disappear for a day or two it all gets pretty “Lord of the Flies” pretty quickly. Joe keeps the family alive, but by the time I get back home the house is trashed and nobody can find a hairbrush or that permission form for the astronomy thing. (Mom? Mom….Mom? I know you are sleeping but if you could just tell me where my blue hairtie is…Mom?) I try to appreciate the fact that I can just walk away from my family with no notice and with no idea when I will be back, and nobody complains. Joe calls friends, family and babysitters to make it work and I try to overlook that there is a chance that there may be cheese on the living room floor, or ketchup in the bathroom when I come home. It does make me feel vital that it takes a team of adults to do half of what I do when I’m gone. because it looks like I’ve taken a liking to breeding rats in the kitchen. If it’s summer, sometimes I put them in the sunshine in the back garden, but that means engaging in a bitter war with the %^&*!! fleece stealing grey squirrel who lives in the backyard. It wouldn’t be so bad if the little crapper just stole fleece (yeah…ok, that would still be pretty bad) but the worst part is that this squirrel will fight for the yarn. I’ve taken to covering the drying fleece with a screen so he can’t get it, but when I go out to bring my fleece back in, he threatens me. Think I’m wimping out? The squirrel doesn’t just yell at me from a tree. When he sees me advance on “his” fleece, he springs from the tree, screaming some nightmarish squirrel expletives at me and makes for my face. I’ve got to find another way to dry fleece in the summer. What’s the lifespan of a grey squirrel? Hank’s uber-macho stringless manly mittens are done. This is a good thing because I don’t believe he was going to be happy to wait for them. Last night when he saw that the balls of yarn were still balls of yarn he sort of lost his cool. 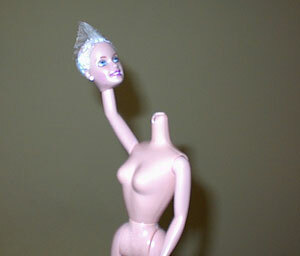 Whipped one of the balls across the room and said “This is not a mitten!”. He’s normally a very nice guy, the strain of the loss of the mousie mitten has really worn on us all. Everyone copes with tragedy in their own way. I think the mitts look pretty good, although the one looking away from you has wonky eyes. We won’t know for sure if they are ok until Hank sees them. If you’ve knit for a three year old then you understand. Just because he wanted pink dragon mittens, and I believe I have knit pink dragon mittens, is no reason to believe that he will believe that these are indeed pink dragon mittens. It’s a total crap shoot. Don’t knit for three year olds unless you are going to be pretty relaxed about rejection. Stick to the small stuff. Hank has rejected tons of stuff, hats are particularly dodgy. I spend a month knitting him the coolest hat, only to have Hank dedicate his life to stuffing it behind his car seat. Then I knit him this hoodie-acrylic-sweatshirt thing. I hated everything about it. The yarn, the pattern, the making up. With each moment and each stitch I cursed it. I swore on all I that I hold dear and all that I believe to be true that I would never, ever knit it’s monotonous miles of stocking stitch and its stupid, stupid pocket and hood again. Screw I-cord hood ties, just screw them. He loves it. All I can hope is that he doesn’t ask me for another one. Three year olds are so charming that their cute little faces and tiny little voices should be considered some kind of hypnosis. I’d knit that kid anything if he asked. Maybe he won’t ask till he’s four. is his choice for “Dragon Mittens”. He is not even a little concerned about the pink. In fact, it is his favourite colour. He grieves that I don’t have enough of the pink to do the mittens entirely in this manliest of colours. These mittens will replace his mouse mittens, one of which met an untimely demise somewhere in between the park and his house. We are concerned about the weather, and the fact that the mouse is lonely and likely, cold. We take some comfort in knowing that the wee mousie is wool…and a mitten, and may therefore be better prepared for his unexpected adventure than a real mouse. (That one was keeping me awake at night, let me tell you). The mouse mittens were knit to replace the dinosaur mittens, which were never worn as they are “very scary mittens”. The mouse mittens were very cool (and Larry..they were grey), and I feel bad that they are gone, but the remaining mousie (aren’t we glad they don’t mate for life) has been reborn as a puppet. 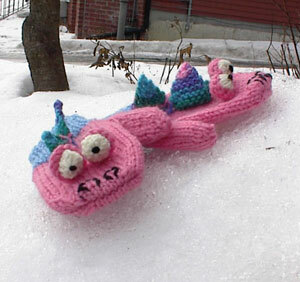 I suggested that perhaps I could put a string on the new dragon mittens but this plan was soundly rejected. Not because he is a big boy, not because strings are demeaning and not because the presence of a string speaks to a certain lack of faith in his ability to keep a dragon from meeting the same horrendous fate as the poor mouse, but instead…get this, it is because mitten strings (even on a pair of pink dragon mittens) are not manly. Any other rules you people want to tell me about?